P/S: I will do an international giveaway in the future. As for Etude House AC Clinic Red Spot Balm Kit, this is my favorite product to lighten acne pigmentation marks! I believe all of us suffered from acne and pimples at some stage in our life and right after the acne/pimples healed, there will be nasty marks left by the acne/pimples on your face as "souvenir" for you to remember it's existence.(Nightmareeee~...!) Tsk! If you have post-acne marks, try this balm! It does speed up the process of marks healing~! 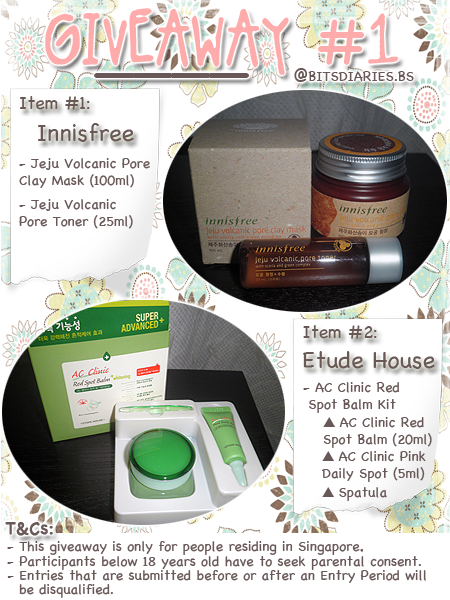 Here's your chance to win them for free together with the Innisfree Jeju Volcanic Set. end on 30th September 2012, SGT 11:59PM.